Home » All food » The Best Stuffed Mushroom Recipe Ever! Are you looking for a delicious stuffed mushroom recipe that will wow you and your guests? 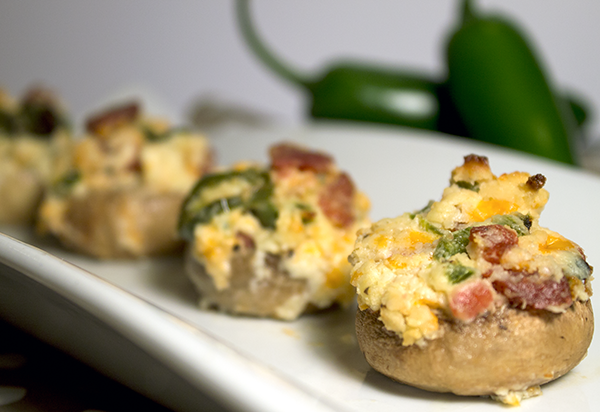 These spicy Jalapeno Popper Stuffed Mushrooms made with roasted garlic and bacon have officially been declared the best stuffed mushroom recipe ever by our friends and family! Bite into one of these scrumptious mushrooms stuffed with a blend of three cheeses, spicy jalapenos, crispy bacon and roasted garlic for a taste experience your taste buds will never forget. They have the same creamy and spicy taste of jalapeno poppers, only these are stuffed inside a mushroom cap. What really sets this recipe apart from other stuffed mushroom recipes is the jalapeno peppers and roasted garlic. The jalapenos adds a touch of spiciness and the roasted garlic adds a sweet, pungent garlicky flavor. These are the perfect appetizer to serve at dinner parties or as a snack on game days. They can be prepared a day ahead of time. Just pull them out of the fridge and pop them in the oven when you are ready to heat them. Serve them with some crackers on the side. Visit my article to get the best stuffed mushroom recipe ever and serve these spicy appetizers at your next party.